1968: Dark Shadows' Barnabas had a strong reaction to light. 1983: Guiding Light's Nola wanted things to be perfect with Quint. 1985: Another World's Sally and Catlin were married. 2004: Days of our Lives' Bonnie enjoyed a Blue County performance. 1955: On Hawkins Falls, Millie Flagle and Lona Corey dyed Easter eggs for a local egg hunt. While they were chatting, Millie sensed that something wonderful was going to happen in Hawkins Falls. Soon after, a man crashed his automobile into Millie's porch. Feeling horrible over what he had done, the man, whose name was Gary Minden, entrusted his cash-filled wallet to Millie before Mitch and Dr. Corey took him to the hospital. Though Millie believed that her premonition was utterly wrong, Mrs. Corey thought something good may have come to Hawkins Falls, after all. 1968: On Dark Shadows, while driving Barnabas Collins (Jonathan Frid) to the cemetery, Victoria Winters (Alexandra Moltke) swerved to avoid Peter Bradford and crashed the car. At the hospital, Dr. Eric Lang (Addison Powell) revealed that he knew something about Barnabas before opening the windows to reveal daylight. Barnabas screamed in terrified anguish. 1976: Murial Williams aired for the final time on Another World as Helen Moore. Helen, Lenore's mother, left Bay City to go on a cruise and never returned. Liz mentioned two months later that Helen was moving to Washington to help Lenore with Wally. 1980: On The Edge of Night, Raven (Sharon Gabet) lashed out at Steve and Calvin. 1982: Kate Linder debuted as Esther Valentine in The Young and the Restless. 1982: On Another World, Sally Frame (Jennifer Runyon) married Denny Hobson (James Horan). 1983: On Guiding Light, Nola Reardon (Lisa Brown) broke down while talking to Quint (Michael Tylo) about her past. 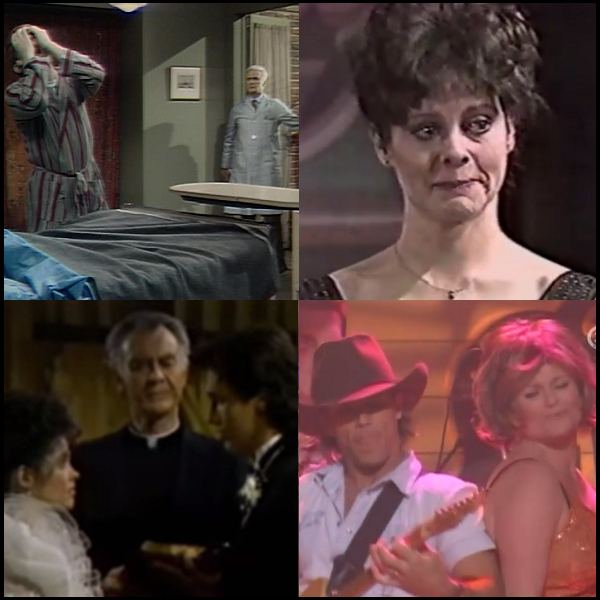 1985: Lanna Saunders aired for the final time as Marie Horton in Days of our Lives. 1985: On Another World, Sally Frame (Mary Page Keller) married Catlin Ewing (Thomas Ian Griffith). 1988: On General Hospital, Duke (Ian Buchanan) told Olivia (Tonja Walker) her father didn't want her involved in his organization. 1993: On The Young and the Restless, friends held a surprise party for Drucilla (Victoria Rowell) and Neil (Kristoff St. John). 1993: Joan Collins began a guest starring role on South African daily soap opera, Egoli: Place of Gold, playing Catherine Sinclair. 2004: On Days of our Lives, country music band Blue County (Aaron Benward and Scott Reeves) performed for Bonnie (Judi Evans). 2008: Stanley Kamel, who played roles on Days of our Lives, General Hospital, Rituals and Beverly Hills, 90210, died at age 65.